Phone Optimized Mantis for All Your Users! MantisTouch is developed to provide a mobile optimized experience for users on the go with support for popular mobile platforms like iPhone, Android, and Windows Phone. A single MantisTouch license is associated with one MantisBT instance covering all users across all popular phone platforms. MantisTouch license includes access to source code allowing customization to your own needs. Future 1.x updates also included for free. MantisTouchRedirect plugin for MantisBT automatically detects mobile browsers and re-directs to MantisTouch. Ability to use pre-canned filters like "reported by me", "assigned to me", "monitored by me" and "unassigned". Filters saved within MantisBT are also available on the go via MantisTouch. MantisHub is a turn-key hosted solution for MantisBT that has exclusive rights to bundling MantisTouch. What is the minimum MantisBT version supported by MantisTouch? MantisTouch can work with MantisBT 1.2.17+ or above. However, it is highly recommended to use the latest 1.2.x version. Do I need to buy a MantisTouch license per user? per instance? 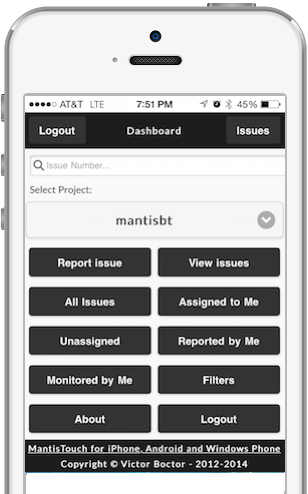 MantisTouch license can be used to serve ANY number of users using a SINGLE MantisBT instance. What can I do using MantisTouch? For issues: add, update, view, deleted, filter, view list. For notes: add, edit, view, delete. 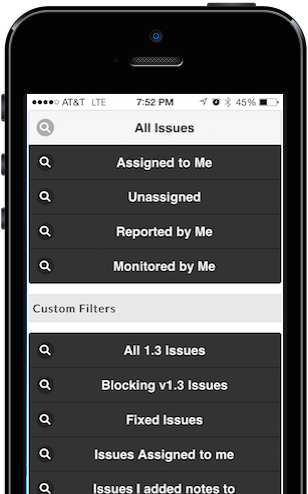 Filters: reported by me, assigned to me, unassigned, monitored by me, and custom filters. How to setup an app icon to MantisTouch on the iPhone? Go to Settings, Safari, and set "Accept Cookies" to "Always". Click the "share" arrow button and click "Add to Home Screen", then confirm "MantisTouch" name. Close Safari and run MantisTouch from the home page icon. Does MantisTouch work with (place your favorite mobile OS here)? Should MantisTouch be installed on the same server as MantisBT? MantisTouch uses web services to access MantisBT, hence, it can be installed on a remote server or the same server. However, installing them both on the same server should yield better performance. Does the MantisTouch license include free upgrades? MantisTouch license includes free upgrades for future 1.x releases. 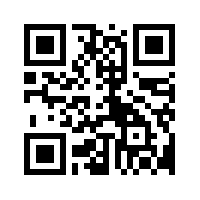 Login to MantisTouch Demo using your MantisBT url, user name, and password.